What is the difference between a DC rated breaker and an AC rated breaker? Good question. Because DC is, well DC, the current is continuous. Once an arc is struck, greater separation is needed between conductors to extinguish the arc. Using an AC breaker in a DC application can lead to an internal arc and fire. That would be a bad outcome. Just how did the insides get exposed, one might ask? Well, there I was working on a solar installation with said breaker placed on a horizontal surface waiting for installation when somehow it was knocked to the floor, creating a large crack in the side of it. Angry I was because this thing set me back some fifty dollars. 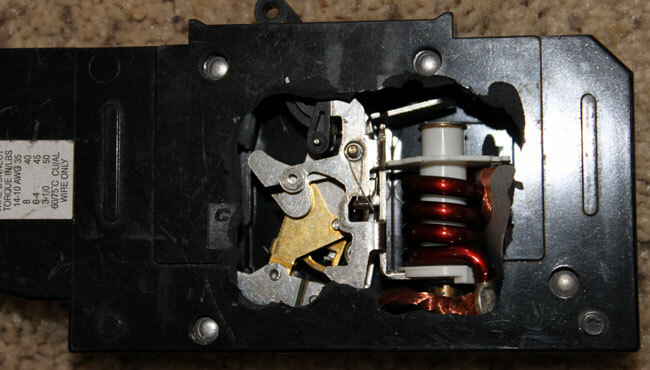 This picture shows the breaker closed, the contacts are still under cover to the left of the exposed parts. 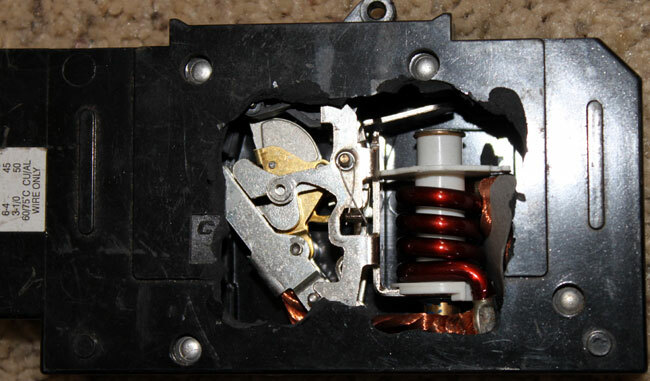 What is cool is one can get a good idea of how a circuit breaker works. As the current flow increases, the magnetic field around the coil increases. When it reaches the trip point the small steel piece is pulled down, causing the mechanical assembly to unlock and open the contacts. Old tech stuff that is taken for granted, probably has saved millions of lives since electrical use became widespread. 1. Grasp plug firmly and remove from socket quickly. 2. Fan the arc with your hat.